Red Bus bingo is one of the Joy of Bingo brands, and runs on the same software as some of the other large UK brands, such as Wink, Posh and 888 ladies. The Red Bus bingo site is generally very pleasing on the eye, and because of its name, the website is designed with a big London red bus on the homepage, and iconic London sights too. The first thing you will notice is how simple the homepage is, one click on the join button immediately takes you to the registration page. Red Bus Bingo has 75 ball bingo and also 90 ball bingo too, and each bingo room has a variety of side games that you can play. Plus a friendly chat room with some very welcoming chat hosts. The price of bingo at Red Bus goes from Free up to 20p+ a ticket. So it’s easy to find a bingo room to suit, regardless of your budget. The bonus from Red Bus bingo is potentially one of the best in terms of the amount. Simply join and deposit between £5-£100, and once you’ve done this, you get a scratch card. Once you’ve scratched this, you have the chance to win up to 2000% of your initial deposit, up to a maximum of £2000. There aren’t many sites that offer a bonus as large as this one. £1,000 Free Bingo – Every day at 21:15 players get a shot at a £1,000 bingo game, and the tickets are free. Loyalty Points – Earn points on all your bingo activity, and then exchange your points for bingo tickets. 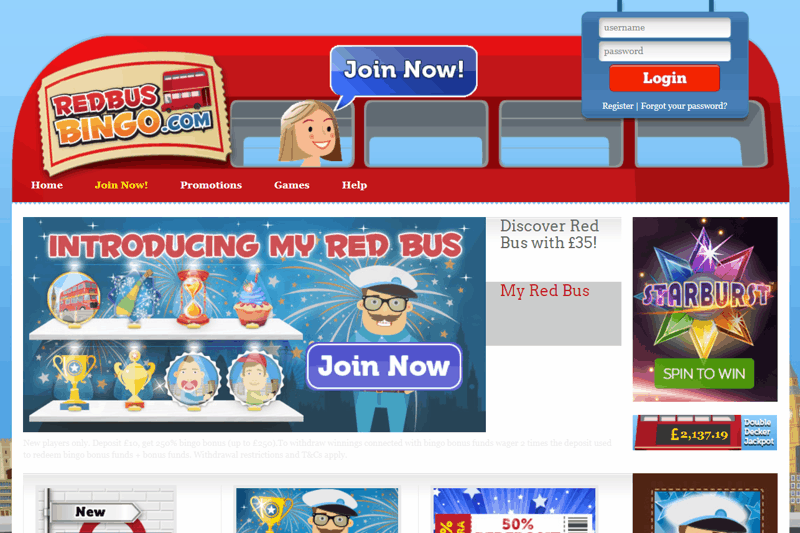 Red Bus Bingo also run special promotions to help you rack up the points even faster. Penny Bingo – If your bingo account is running a bit low, head on over to the penny bingo games where you can play for just 1p. RBB also runs special penny bingo games on a saturday where you can win a share of £100. 50% Re-Deposit Bonus – Get a tasty 50% bonus on every depositof between £10 and £100. VIP Club – Loyal bingo players could find themselves invited to join the Joy of Bingo VIP Club which brings with it a host of benefits including deposit bonuses, hospitality events, VIP bingo rooms and more.